SO BUSY. I have three posts to post, and nary a minute to actually take the time to write something!!!!!!!!! So I'm sneaking this in over my lunchtime at work and it will have to be short as I have only 23 minutes in which to write it. On Sunday, we took a quick trip up the Valley to visit my in-laws (un-invited, bien sur). 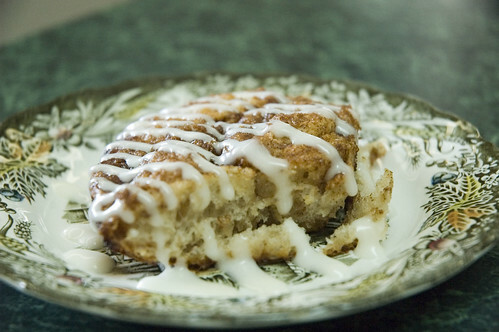 So to lessen the pain of the not-quite-unannounced company, I decided to bring a peace offering in the form of meltingly warm cinnamon-cardamom rolls. I have to say though, timing these little suckers is a PAIN. No matter what way you go, it takes 3 hours to make them. And they're at their best directly out of the oven. So if you want your cinnnamon buns for a nice and relaxing 9AM brunch, guess who's NOT going to be relaxing. Hmph. So I thought I would beat the system, so to speak. 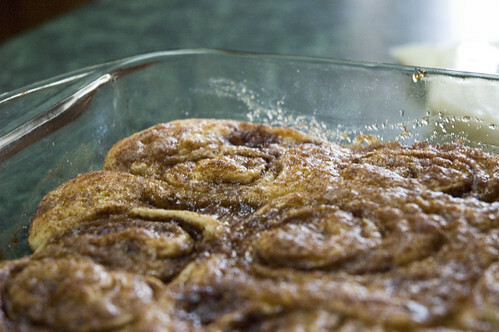 I figured that if I made up the cinnamon buns the night before, and just left them to rise overnight, and then brought them to my in-laws' place to bake, I would be set. Don't do this. Letting the dough rise this long really had a detrimental effect on the finished texture - they weren't the doughy balls of cinnamon I have come to love and they would have been much better if I'd managed to do the get-up-really-early and throw them together thing. They were still okay, don't get me wrong, but I think I owe the in-laws another batch of these guys, next time done right. On the upside, if you have a breadmaker, they are pretty easy to put together. I just throw all the dough ingredients into my breadmaker and set it to the "dough" cycle. When that cycle finishes, I just make the recipe as directed. If you don't have a breadmaker, you can do this by hand, or you can do it in a food processor (easiest). I'm always a fan of getting someone else to knead, so I think you should all get breadmakers. 1. Add all ingredients to bread machine in the order specified in your manufacturers instructions (generally, all ingredients should be at room temperature, start with water, then put the flour on top. Put the sugar, oil, spices and salt around the outside, make a wee well and stick the yeast in there). 2. Set breadmaker to dough cycle and let run for required time (about 1 hour or so). If making by hand, combine all ingredients, knead until relatively smooth and then let rise for an hour or so). Or just buy dough. 1. Spray a 9x13 pan with cooking spray. 2. 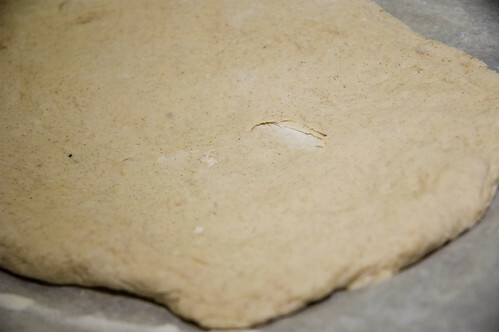 Slowly, gently stretch the dough to a large rectangle. You want it to be at least 12 inches long and at least 9 inches high. 3. 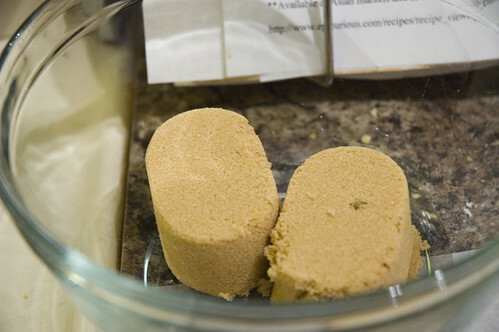 In a small bowl, combine the brown sugar, cinnamon and cardamom. 4. Melt the butter and brush the dough rectangle with some of it. The less butter you use, the lower in fat your rolls will be. The more you use, the better they will taste. hehe. 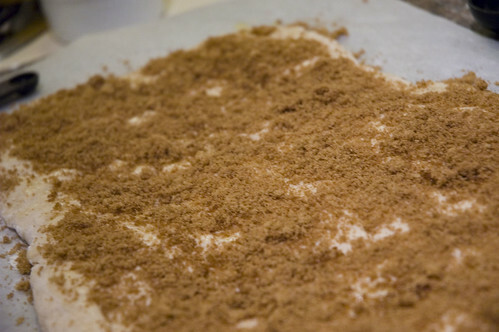 Sprinkle about 2/3 of the cinnamon mixture overtop. 5. Slowly, gently, roll it up. 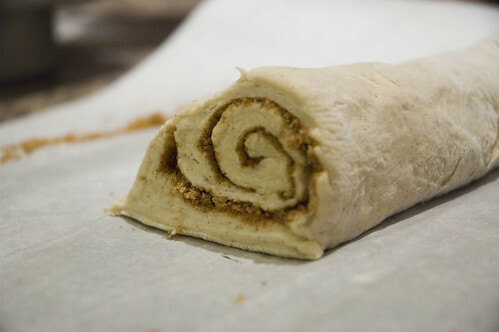 Roll it up the long way (i.e., at the end you want at least a 12 inch tube of cinnamon roll dough). 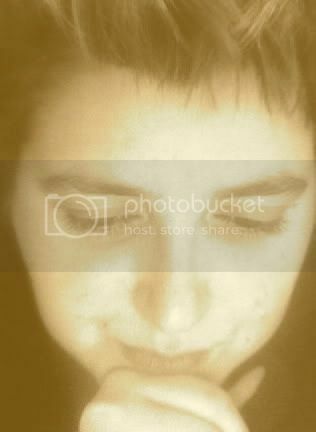 Pinch the edges to keep it together. With a serrated knife, gently cut off 1-inch slices of dough. 6. Place these slices in your prepared 9x13 pan, slightly spaced apart (in theory, they should rise). Let them rise for 1-2 hours (this is where I erred). 7. 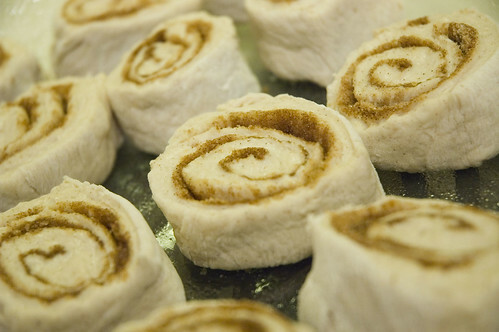 When they are done rising, brush the rolls with a little more butter and sprinkle the remaining cinnamon/sugar mixture over top. Preheat the oven to 350F and bake for 20 minutes or so. 8. While the buns are baking, make the cream cheese icing, if desired. Take the cream cheese (softened), icing sugar and milk and beat together with a hand mixer until smooth. If you find the icing too thick, add a few more drops of milk. If it's too thin, add a little more sugar. I like to put the icing in a zip loc and snip the corner for drizzly presentation. Enjoy them while they're warm! They'll make your house smell incredible for the rest of the day and people LOVE these things (myself included - last time I made them, which was over 2 years ago, I ate almost a whole pan, so I had to stop making them!). You can see more pictures of him in my flickr set HERE. You can slow down the rising process for pretty much any dough by putting it in the fridge, so you could make the dough the night before, let it rise at room temperature for about 2/3 the recommended time, then put saran wrap over it and pop it in the fridge. Pull out in the morning, let come to room temperature again and bake. After searching for dinner inspiration, I saw these and decided to spend my afternoon doing this instead. They were fantastic. And so easy to make (other than all the rising time). The husband was very pleased when he came home (though, I think he wanted more cream cheese frosting...I don't think he got the 'lowish fat' part of the memo on these babies). He has taken most of the remainders into work today to avoid me scarfing down the batch. Which is good. Because I love me a good cinnamon roll. Thanks for all the great recipe ideas! 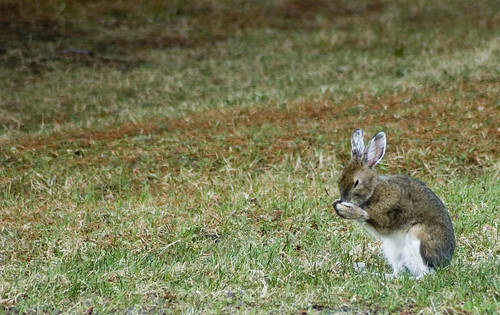 Mmmm...good looking buns and bunnies.